Eyelid surgery is quite a common procedure. It is a surgical treatment where excess fat or skin is removed from the eye region; this provides the patient with a more youthful appearance. To learn more about this procedure at the Dr Lanzer Clinic, please read the information provided by the Dr Lanzer team below. How Can Eyelid Surgery Make the Face More Youthful? As we age, the structure of our face changes; this also applies to the area around the eyes. The lower eyelid can get a more swollen appearance, caused by an accumulation of fat in the area, while the upper eyelid may become droopy and saggy. These are all concerns that can be addressed with eyelid surgery. What Are the Effects of Eyelid Surgery? During eyelid surgery, a cosmetic surgeon can remove the excess amount of fat from the lower lid. As a result the lower lid will sit better on underlying structures and some of the wrinkles that were there before will have smoothened out. The upper lid can also be treated with eyelid surgery; this can involve the removal of fat, excess skin, or both. After this procedure is performed, the patient will experience eyes that are more “open”, instead of the tired look. At the Dr Lanzer Clinic, eyelid surgery is performed by laser. The laser used for a blepharoplasty is a special type of laser, which can be used to cut the skin, much like a scalpel; this happens when the laser gets more focussed. The laser can also be de-focussed. When this is done, surgeons can treat skin defects more effectively. The use of a laser for cosmetic surgery does come with additional advantages where results are concerned. In addition to addressing excess fat and skin around the eyes, the laser can also vaporise some fine wrinkles and lines, providing the patient with smoother results. Patients must incorporate some downtime after their eyelid surgery. If sutures are used during the procedure, they will be removed eight to ten days after you had the procedure. Patients may also experience some slight bruising during the first couple of weeks after the treatment. During the recovery process, patients are allowed to use makeup. However, if you have sutures, it is recommended to wait with makeup until those sutures are removed. It is also advised to not use contact lenses until at least a week after the procedure. To protect the eye region post-surgery, Dr Lanzer recommends protecting the skin against the sun with a good sun lotion. Sunlight can cause premature damage to the skin, so results can be affected by not using the proper sun protection. Which Patients Are Eligible for Eyelid Surgery? 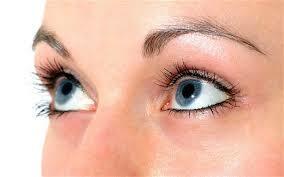 Patients who have clear bags under the eyes or drooping eyelids are good candidates for the procedure. There are also patients who experience obstructed vision due to the accumulation of fat and excess skin in the upper eyelid. Naturally, these patients are also excellent candidates for eyelid surgery. Eyelid surgery performed by laser can reduce bleeding during the procedure; this since blood vessels are sealed off with the laser during the cutting process. While patients will still experience some bruising and swelling post-procedure, the degree will be less. Will I Need a General Anaesthetic for Laser Eyelid Surgery? Most patients will get a light general anaesthetic before the procedure; this ensures more comfort for the patient, since the surgeon will work in the eye region. If you have concerns about the use of general anaesthetic, please contact the Dr Lanzer Clinic or convey your concerns to your cosmetic surgeon. Where Is Eyelid Surgery Performed? Dr Lanzer has his own fully accredited operating theatre; this means patients will not be charged excessive hospital fees. Dr Lanzer also works with the same anaesthetist for his procedures, which also benefits patients who are considering having their treatment at the Dr Lanzer Clinic. Patients who want to get more familiar with our Day Surgery Centre can contact our friendly team for more information. We understand that it is important to be comfortable with the clinic you have chosen, so do not hesitate to get in touch if you require more information before you make your decision. How Can I Make an Appointment for Eyelid Surgery at the Dr Lanzer Clinic? Patients will require an initial consultation with Dr Lanzer before they can obtain eyelid surgery at our clinic. To make this appointment, simply head over to our website contact form, send us an email, or contact the Dr Lanzer Clinic by telephone. For more information about eyelid surgery, please check out the additional information pages on our website. Alternatively, contact our clinic for more info.